As I read this nonfiction title, I kept wondering why science in high school (or college) couldn't have been this fascinating. Maybe it's because school texts are so dry and politically correct. I have no idea, only that this book made me wish I had paid more attention. Simply put, this is fascinating. Streever is a scientist/environmentalist/researcher who explores the science of weather, as well as the history of man's fascination with it. This book compiles a year of research. He begins outside of Alaska, studying a caterpillar that is so frequently frozen that it takes ten years to go from pupa to moth. Ten years! He has numerous anecdotal stories with some heavy science sprinkled in, such as how water molecules change amid temperature changes. The pace is fast and snappy and makes all the details easily absorbed, without feeling like it's dumbed down or too deep. One especially fascinating aspect of Cold is the stories of men and their search for the North Pole. I'm not sure why, exactly, men throughout history have been so interested in traversing miles of brutal cold to get there. He goes through notes and journals of many of these explorers, most of whom are spectacularly unprepared and most of whom die on the way. So few actually did make it. What's amazing is the descriptions of their journeys. Death was always present and it seemed the life of their companions was pretty cheap, as they would just keep going as members died off. See, I don't get it. I'd be at the nearest plush hotel, with some hot cocoa and maybe brandy, in front of a roaring fire. Why the cold? 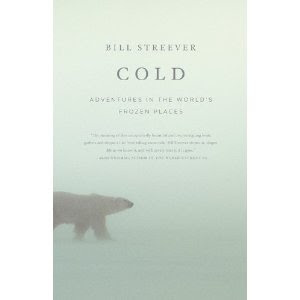 Streever weaves the unassailable facts of global warming into the book, never too preachy but not backing off with the clear evidence of disappearing ice and changing weather patterns. He clearly cares about the issue and knows what he is talking about, as his facts are not biased or partisan in any way. One caveat: this book is best read when you are warm, as the descriptions will have you chilled to the bone quickly. Special thanks to Kelly Leonard of Hatchette Group for the Advanced Reader's Copy. Sounds like a title I'll keep for a hot, muggy July or August week! I have a sample of this on my kindle. It sounded very interesting, guess I'm going to have to pick it up. Great review! This book sounds amazing! I read about quite a few explorers to the North Pole in Arctic Dreams, but those stories always fascinate me, too. And I'm totally intrigued by the caterpillar that takes ten years to pupate! Thank you for this review. I hope it does spark interest in some folks! We really like Alaska. another one that I have added to my reading list. I majored in Geography at University and find myself still attracted to such books. Thanks.